Even though District 7 is located next door to District 4, The Astronomer and I rarely venture to this part of town because their brand of suburbia isn’t rockin’. District 7 is Saigon’s first-ever planned neighborhood and is full of wide roads and fresh air. I’ve got nothing against order and cleanliness, but the place just feels a bit creepy to me. District 7 is home to the city’s largest group of expats—the Koreans—and their influence on how the community has developed can be seen at every sterile turn. Often referred to as Little Korea or Singapore of the future, this neighborhood has a distinct flavor all its own (kind of like kimchi). On assignment for AsiaLIFE, I traveled to District 7 for a feature entitled Street Smart. Although the majority of the establishments in this neck of the woods are generic, boring and a wee distrubing (check out Petite Ange – 5B 21 Park View Building, Nguyen Duc Canh Street), I did encounter two culinary gems—Urvashi and Love Noodle House. After being evicted from their District 1 location, Urvashi relocated to District 7 late last year. 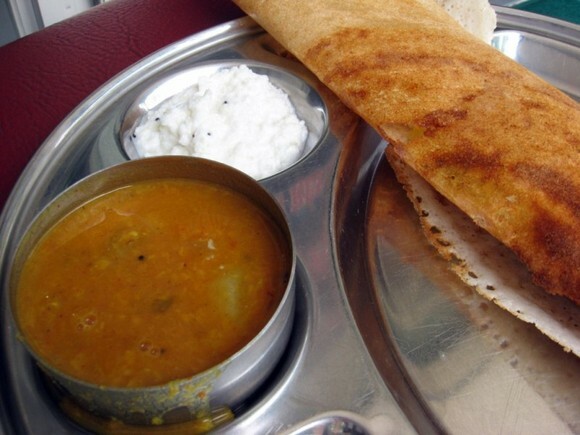 Uravashi specializes in south Indian cuisine and is known for their dosas. This suburban outlet is just as good as the original downtown location, and everyone’s favorite Mega Dosa is still a fabulously tasty treat at 35,000 VND. The chilled spicy coconut chutney is unbelievably good paired with the potato and onion stuffed Mega Dosa. While this restaurant’s name conjures up images of canoodling couples sharing bowls of steaming hot noodles, the reality is anything but. Love Noodle House is a casual hole in the wall that wouldn’t be out of place in London or New York City. The speciality here is Malaysian and Singapore rice and noodle dishes, and the Malay chef heading the kitchen knows exactly what he’s doing. 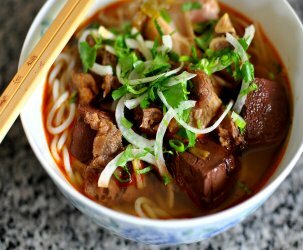 The classic Malay dish Bak Jut Teh set (57,000 VND), which consists of meaty pork ribs in a complex broth of herbs and spices including with rice or noodles, tastes just like it was made in the streets of Kuala Lampur. 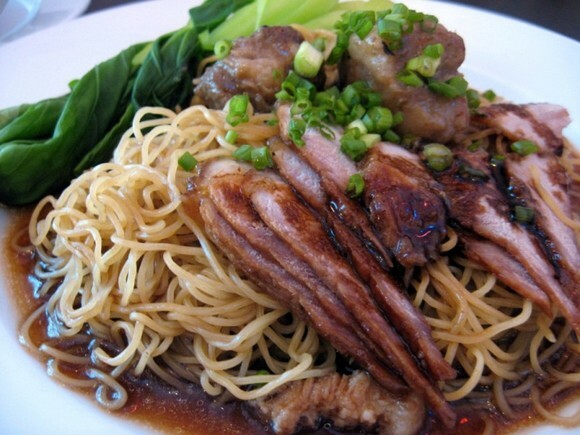 Another hit are the stir-fried egg noodles with slices of barbecued pork and pork ribs. The sauce is notches better than classic Chinese oyster sauce. 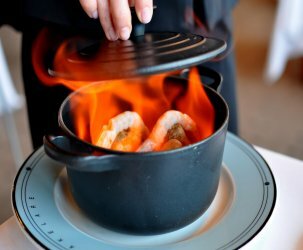 If your favourite Malay or Singaporean dish isn’t on the menu, the talented team in the kitchen will whip it up for you. How that for great service? I’m surprised no Malaysians have corrected the info mentioned in Love Noodle House. The picture features Wantan Noodle with Charsiew/BBQ Pork. Its a popular Cantonese street food found in Hong Kong, Malaysia, Singapore and i suppose in many china towns across the globe. Bak Kut Teh is a very famous herbal pork both found in Malaysia. It’s usually served in early morning or late night. There are of course peppery variation found in Hong Kong and Singapore. Both which is certainly no match for the Malaysian Chinese version as it’s broth is very unique and much sought after by visiting asian food lovers to Malaysia. 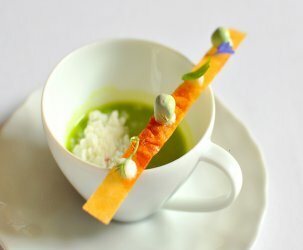 It has become a specialty of Malaysian cuisine. It is incorrect to list both these dishes as a MALAY dish because a Malay person is an ethnic group in Malaysia whose religion is Islam. Islam forbids the consumption and handling of pork. 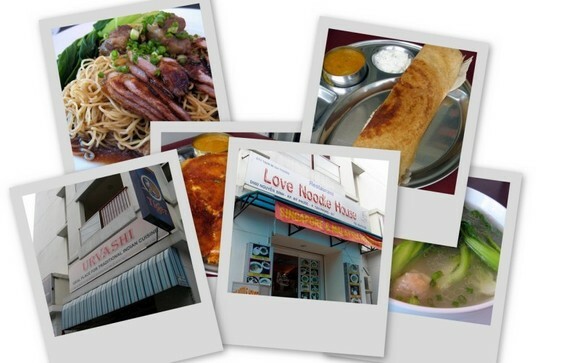 You can only refer to these dishes as Malaysian Chinese street/hawker food. Hope you can correct this as it can be deemed rather offensive by some. If any readers are visiting Malaysia, we would be happy to provide suggestions to popular local eateries and attractions.